The eighth annual Coaching Digital Learning Institute (CDLI), organized by the Professional Learning and Leading Collaborative (PLLC) team, in partnership with the Golden LEAF Foundation, was unique: the facilitators leading the capacity building sessions and hands on learning activities were all volunteers who have previously attended past CDLI events or other Friday Institute capacity building trainings and cohorts. This year, the students truly became the teachers. “It’s absolutely, 110 times different… These are people that work with children, they work every day with elementary, middle school, high school students. They work with the teachers that are working with the kids. So you know they’re not going to encourage you to use something that’s not effective,” said Beth Davis, an academic coach at Graham High School in the Alamance-Burlington School System. The CDLI is designed to support K-12 instructional technology facilitators, those taking the lead in implementing digital transitions in their schools and districts. CDLI builds capacity and enhances professional development, practice, and adds mobile and digital tools and resources to expand learning and teaching environments. This year’s theme centered on a quote by Sir Arthur Charles Clarke: “Any sufficiently advanced technology is indistinguishable from magic.” As the ones charged with assisting the growth of digital learning and teaching in North Carolina schools and districts, these educators aren’t just coaching and supporting technology, they are coaching and supporting magic. This doesn’t mean pretending to saw students in half; educational technology provides and supports “magical” experiences to all stakeholders in schools undergoing digital transitions. Watch the video below to see what participating teachers had to say when we asked them about this year’s theme. Not every attendee this year was a North Carolinian. Because of a previous partnership between the Friday Institute for Educational Innovation and Ohio’s Trailblazer Teachers program, sponsored in partnership with Battelle, five coaches traveled from Ohio to participate in the training so they could give back and share their work with others. “Honestly, the Trailblazer program really ignited something in me to push forward and to really just try and get the word out on how to integrate technology and blended learning. We all feel the same way, that’s why we’re all here,” said Casey Clark, English teacher at North Canton Hoover High School in Canton, Ohio. This annual professional capacity building opportunity is designed for instructional technology facilitators, media coordinators, instructional specialists, and technology-driven educators and mentoring staff, positions that are often overlooked in traditional professional development offerings. Clark noted that, in a district of 300 teachers, he is the only person learning how to coach others to implement blended and digital learning practices. He said training, like that offered by the CDLI, helps coaches learn not only how to use technology in the classroom, but also how to get tech tools to teachers and students effectively and with purpose. Through providing professional learning programs, developing educational resources, conducting research, and advocacy, the PLLC team and the Friday Institute are working to address this immediate need. Erase the Line and Swim Laps! Dr. Ruben Puentedura developed the SAMR model as a way for educators to reflect on how they are incorporating technology into their instructional practice: Is it an act of Substitution? Augmentation? Modification? Or Redefinition? 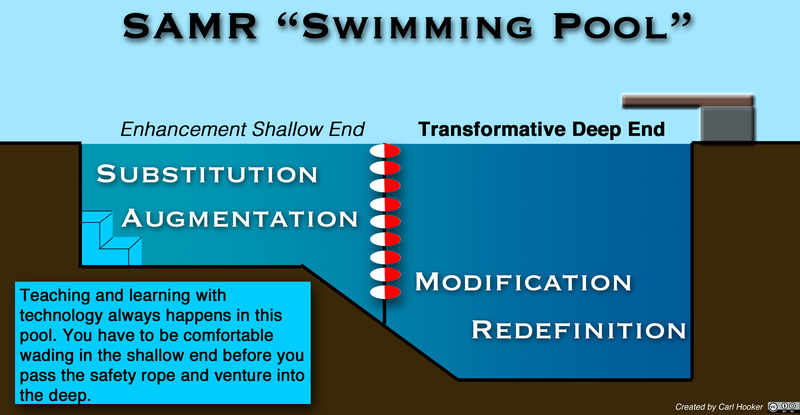 This model is often depicted as steps, a ladder, or a swimming pool, suggesting that educators climb or swim towards the Modification and Redefinition categories. There is a line separating Substitution and Augmentation from this Modification/ Redefinition goal – a line dividing educational “Enhancement” from educational “Transformation”. The message given is that educators must “teach above the line” with a focus on Modification and Redefinition. This, however, is where a problem arises. Having shared this perspective with dozens of schools and administrations, this modified version is not only making sense, but is a means of taking successful steps towards a digital culture in schools and districts – especially when there is a struggle to get educators to embrace teaching with technology. The goal now is not to “teach above the line”, but to reflect and maintain a flow of student-centered, digitally supported instruction in each of the SAMR categories as appropriate to the context of the learning and teaching environment. One hundred percent of my experiences sharing this new model has swayed reluctant educators and given them a perspective on teaching with technology that they feel they can attain while growing toward the higher levels of the SAMR model. Rather than climb ladders or stairs, what we really need to do is ​swim laps. We can all agree that while a growing number of schools and districts across North Carolina are making the transition to technology-enabled learning, technology is not the driving force behind these initiatives; teaching and learning always need to be at the forefront. On October 28th & 29th, we hosted over 130 enthusiastic Instructional technology facilitators, media coordinators, instructional specialists, technology-driven educators and mentoring staff who have taken the lead in implementing digital transitions in their schools and districts, leading their colleagues towards the future. In honoring this effort and their work, we went Back to the Future for this year’s event and when we do Professional Learning, we don't just engage, we have a blast!! It is an honor and so much fun to be in charge of this annual event at the Friday Institute. The Coaching Digital Learning Institute (formerly the Technology Leader’s Institute) offered by the Professional Learning and Leading Collaborative at NC State University's Friday Institute for Educational Innovation, just wrapped up it’s 7th year, (My fourth year leading this event). This one of a kind professional learning event is designed to support K-12 educators’ digital transition needs in districts supported by the Golden Leaf Foundation, our partner for this institute. It is a fun-filled two days of learning, playing, and digging deep into what it means to coach others through a digital transition. There may not be flying cars and hover-boards in 2015, but there truly is so much to offer our students when it comes to digital learning and teaching. Twenty-eight guest educators and instructional coaches from across North Carolina, along with Friday Institute and NC State University staff, facilitated 30 workshops, a mini-EdCamp, a MakerSpace inspired playground experience, a Goose Chase, Breakout EDU challenges, a participant driven tool-slam, and an ignite talk by Spring Lake Middle School Principal and 2014 NASSP’s National Digital Principal Award recipient, Derek McCoy. Needless to say it was a packed two days filled with exploration, taking risk with intention, failing forward, building professional networks, and sharing best practices and strategies to support student-centered learning and empowering educators at all levels. This year’s institute was created with the amazing support of Emmy Coleman, Lisa Hervey, Alex Kaulfuss, Brittany Miller, and the amazing Friday Institute Coordinators – Thank you, Team! Interested in more about this year’s CDLi, 2015? Check out our website. We truly get into our themes, and though costumes are not required, they are certainly admired. Even our participants join the fun. Video is from CDLi15 event.